Handheld recorders continue to be as popular as ever. And they should be, they are efficient and very convenient. However, some people think that it’s difficult to find a quality audio recorder that doesn’t cost an arm and a leg. But, we are here to prove them wrong. Choosing an excellent portable audio recorder is quite simple. You just need to answer a few easy questions, like why you need one and what features do you need it to have. In this article, we’ll show you how to use your answers to choose the best device for you. We’ll also be reviewing the Top 10 best portable audio recorders of 2019 to help you make a perfect choice. Why Do You Need The Audio Recorder? How Many Tracks Do You Want To Record At The Same Time? Which Is More Important To You – An Internal Mic Or An External One? What Accessories Would You Need? The Zoom H6 is a 6-track recorder as the name suggests. It is a really versatile device, and if you need something that will deliver on exceptional audio quality, it’s a great choice. It comes in a portable size and with its solid construction, its built to last. The Zoom H6 can record more than 2 hours of exceptionally high-quality audio at a time. Of course, at the price point of the Zoom H6, you should expect quality audio. Perhaps the Zoom H6’s best feature is that it comes with two interchangeable mic capsules – one for mid-side mic and one for XY. These are used for recording audio using different mic positions to produce the results you’re looking for. This is where things get a little disappointing. Creative professionals for whom we feel the Zoom H6 is a perfect match need tons of space. And this device only comes with 2GB. But it is compatible with SDXCs. Problem is, even though SDXCs can come in sizes up to 2TB, this device can only take SDXCs of 128GB in size, but that’s a lot more than the 2GB included so you should be fine most of the time. Interchangeable mics and the option of adding external mics. The construction is solid and very durable. A little complex to operate for a beginner. Sound Devices isn’t one of the more well known audio brands in the market. But they have delivered some high-quality products in recent times like the MixPre-6 and its sibling, the MixPre-3 featured in this review. The way Sound Devices designed this device, it can work as a recorder, a field mixer, and a USB interface all at once. Also, the recorder can operate either using batteries, mains power, or via your computer using a USB. The MixPre-3 is a 5-track recorder with powerful capabilities. For instance, it has an Iso Mode. In this mode, it records to all three auxiliary inputs, alongside a live stereo mix and at an impressive sample rate of up to 96kHz. This means that you have five different recorded channels which could, for example, be three audience mics as the auxiliary mics and a live stereo mix from a mixing desk. The Iso Mode offers endless creative options for those who are looking for out of the box field recordings. Furthermore, when you use the MixPre-3 as a USB interface, it can provide five inputs in total to the computer and two outputs from it. By the way, for iOS and OS X users, this recorder is USB 2.0 compliant. And there’s also an ASIO driver for those who use Windows OS. You’ll receive your MixPre-3 package as a bundle with an 18-page guide, a battery module (4 batteries), plus a USB cable. Moreover, the USB cable splits the USB-C connector of the MixPre-3 into two USB-A plugs. This is important because one USB-A port won’t be enough to supply the 7.5W power that the device needs. Finally, the recorder is also well built with die-cast aluminum construction and rubber panels which make the recorder durable and easy to mount. Looks solid and comes in a compact size. Also works as a USB interface. In the M-S modes, there’s no polarity-invert option for the side channels. 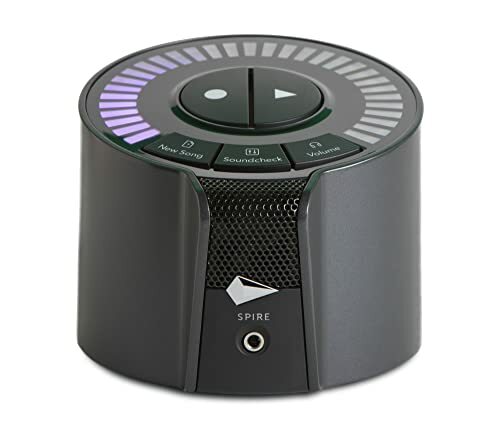 The iZotope Spire Studio is the companies first attempt at venturing into hardware. As you would expect from an audio software giant, it comes with powerful software backing it up. The built-in mic, as well as the two xlr-1/4 inch combo inputs, are all studio grade. Also on the xlr inputs, it’s very impressive that iZotope fitted them with high-end studio standard Grace Design preamps. You’ll also find a built-in battery in this unit which can power the device for up to 4 hours of recording. The recorder comes with a couple of effects and processing features that help to fine tune audio quality inside the hardware. And, of course, there’s the fantastic integration option that iZoptope included for connecting your Spire app to iOS devices. We love the design of this device as well. It looks simple and yet it’s very rugged. It’s also effortless to read any visual feedback from the Spire Studio. And, you don’t have to worry about mal-handling this device when recording on the go. It’s a big boy and can take care of itself. The design is super sleek, with no protrusions, and it’s also very pleasing to the eye. No USB to work with mobile devices. Comes with very few effects. 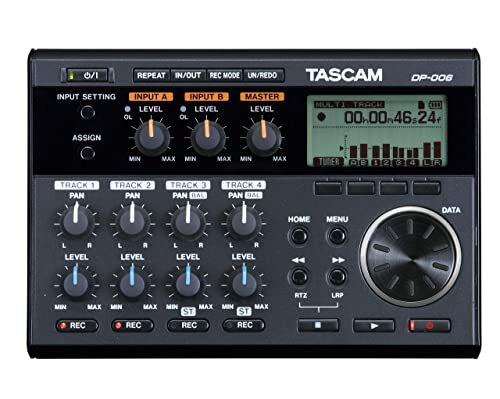 The Tascam DP-006 is a fantastic recommendation for musicians who may feel inspired to record song ideas wherever they may be. It operates on batteries, is super compact and can easily go anywhere with you in your gig bag. And, if you want to make your setup even more professional, you can mount it on a tripod. It comes with high-quality omnidirectional condenser mics, making the Tascam DP-006 Digital Portastudio all you need to record your vocals or your guitar on the go. And there’s no question of low audio quality mics here. Tascam modeled the built-in mics after their highly rated DR series. Furthermore, there are two inputs with quarter-inch jacks that allow you to hook this up to external instruments easily. For instance, you can hook this up with your synth, your guitar, or just about anything. Also, there’s an external cable which can be used to connect to other sound devices or your iPad. As for memory, this recorder comes with a 16GB memory and is also compatible with SDHC/SDE cards. You can also easily move your songs out of the device quickly either using your USB 2.0 or a SD card reader. Comes with two omnidirectional condenser mics. USB 2.0 connection, making data transfer very rapid. Comes with four batteries which can deliver up to 8 hours of recording. The Undo/Redo function is a very handy and thoughtful inclusion. Even though this supports an export function, it’s slow. The Yamaha PR7 is a not just a pocket recorder; it is also a pocket-friendly recorder. In that, this is one of the best budget options you can get, when it comes to portable recorders. This recorder comes in a really compact size, something that can easily fit into anyone’s pocket. Hence the reason for its name. It measures at about 4.7 inches in length, 1.4 inches in width, and 0.4 inch in depth. Besides its size, another feature that makes this device really convenient is its USB connectivity. So, it’s a great choice if you’re looking for a recorder for scratchpad recording. And by that, we mean recordings such as conducting interviews as a journalist. Or even songwriters who need to quickly record a song idea. The phone-style carrying case that comes with the unit easily fits onto any tripod or even your belt. Also in this package, you get a mic-stand adaptor as well as Steinberg’s Cubase AI software. Lastly, we’ve got to comment on the interface of this device. It’s really simple and elegant too. The stunning on screen black on amber contrast, as well as the easy to read display makes this a joy to use. Pocket-sized makes it perfect for on-the-go, scratchpad recording. Excellent recording quality for the price. Not the best choice for serious music recording you want to further process in a DAW. 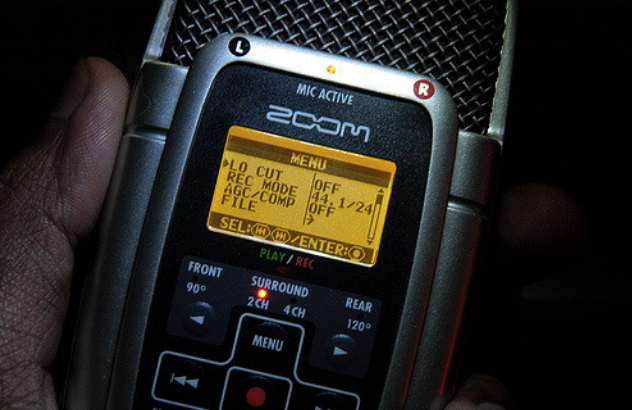 If the Zoom H6 was a bit out of reach for you, here’s another quality recorder from Zoom – the Zoom H4N. It might not come with some of the sophisticated features that the Zoom H6 packs. But when it comes to audio quality, as usual, Zoom doesn’t disappoint. This device can pre-record, and capture simple audio like interviews and lectures excellently. It also comes with a voice activation function as well. The Zoom H4N was specifically made with the amateur filmmakers and musicians in mind. 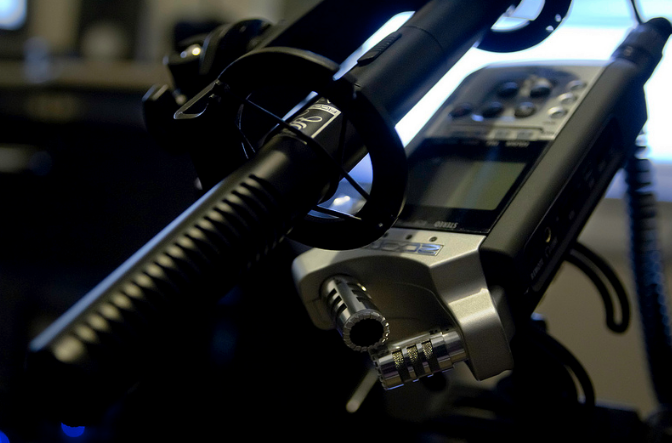 We love the unidirectional XY mic on this recorder. It comes with an excellent depth of stereo but doesn’t skimp on definition. 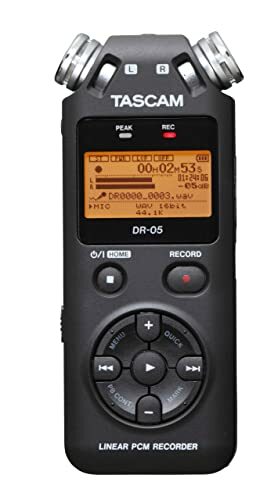 So, this is a fantastic recorder option if you need something that captures a field recording for film or for live performances. The device comes with four-track recording, but it’s understandably not as versatile as that on the Zoom H6. Although, both devices actually record at the same high bit rate and sampling frequencies. Lastly, for amateur filmmakers and podcasters, it might interest you to know that you can hook the H4N to a video camera for audio recording of your film. As expected from Zoom, the H4N comes with exceptional audio quality. Ideal for amateur filmmakers, podcasters, and musicians. Comes with XLR/TRS inputs for connecting to mixing consoles. 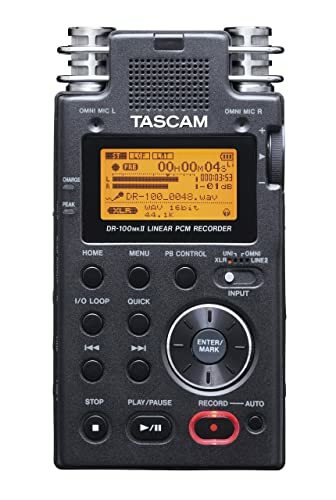 While we recommend the Zoom H6 to creative professionals, we would recommend the Tascam DR-05 to business professionals. It’s a no-nonsense device that’s easy to use, delivers audio at an exceptional quality and has a very attractive price. Its OTRF mic configuration ensures that the mics deliver on the excellent stereo depth needed for business meetings and conferences. The Tascam DR-05 comes with two omnidirectional mics. And as mentioned, the mics are in an OTRF configuration. So, they deliver on a really wide stereo image. But, in this benefit lies a small drawback. This is not an ideal choice if you just need to focus on a single voice rather than many. Plus, the mics are not adjustable. And finally, let’s talk briefly about Level Align. This is the feature that adds compression to your audio on the Tascam Dr-05. This feature will even out uneven volumes. In that, it will increase the level of low audio signals and lower the level of higher ones, so the overall level is far more balanced. This is another reason this is excellent for boardroom meetings. An ideal recorder for business meetings and conferences. Can be paired with dictation software for convenient note-taking. Level Align helps balance out uneven volumes. Not ideal if you need to focus on a single voice. The Olympus LS-14 is a very straightforward device to use. This is exactly what the manufacturers decided to focus on when they designed this model. And they succeded, the LS-14 is about as easy to use as you can imagine, without any unnecessary features and is fantastic at capturing high fidelity audio. This recorder comes with four modes which form the centers around which its operations revolve. There’s the tuner mode which works like a regular guitar tuner. It might not beat your regular tuner apps, but it’s always a nice feature to have. Then there’s the Smart Mode which should keep your recording nearly idiot-proof. It features a 30-second soundcheck function where the recorder automatically sets the recording levels for you at the correct levels. It’s a great feature, especially for those who are new to mobile and field recording. Then there’s the manual mode which hardly needs explanation. And lastly, there’s the Quick Mode which allows you to jump straight into recording if you don’t have the patience to use any of the other modes. Well, in practice, we do not see how this would be particularly useful. But since it’s not doing any harm, we can hardly complain. This device does not come with as many bells and whistles as you would find on any of the Zoom devices. The only extra features included are the tuner, a metronome, and the built-in speaker. Nevertheless, we’re still impressed by the Olympus LS-14 for its simplicity. Can record high-resolution WAV files, and compressed MP3’s. Comes with a USB port but can’t be used as an audio interface. Does not record audio in manageable file sizes. Audio files aren’t recorded in common formats. Therefore, to import to a DAW, you’d have to do a sample-rate conversion. The Sony PCM-M10 comes with a lot of great features. First of all, let’s talk about the built-in mics. They are one of the primary reasons we love the Sony PCM-M10, being quiet and very high quality. Since they are omnidirectional, they pick up ambient sound very well and are actually quieter than quite a few of the recorders we have looked at. 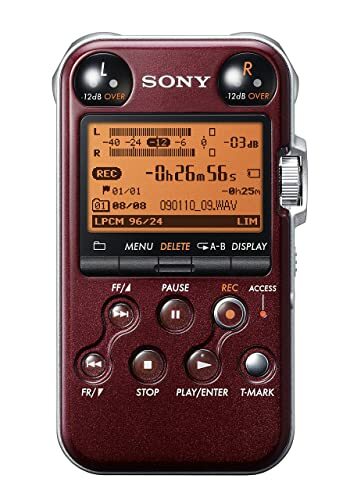 But the PCM-M10 isn’t quite an instant recorder, it requires a startup time of about 10 seconds to begin recording whatever captures your fancy. In build, this is a small unit, but it’s relatively heavy. And the body is made of plastic with a metal frame, but don’t worry, the whole construction is more than solid enough. Now, we were thrilled that you can turn off all the LEDs on the interface of the recorder. From the red Record to the backlight. This is great for when you need to record discretely. Ability to turn off the LEDs for discrete recording. The USB could be a bit faster. No MAC software for OS users, only windows. And we round off this review with the rugged, high end, and very capable Tascam DR-100. It comes with numerous cutting-edge features, as you’ll find out. This is a very versatile unit especially with regard to the types of microphones used. The recorder has both Cardioid and Omnidirectional mic pairs. And in addition to these, there are additional XLR mic inputs to connect external mics if needed. So, altogether, this is an ideal recorder for interview, music and professional recordings. With its USB 2.0 port, you’ll be able to rapidly transfer your files either to your PC or any other device for further processing. It does come with a lot of buttons. But in many ways, that’s preferable to having to scroll through loads of options before getting to the right one. So, we think this was a really smart move on Tascam’s part making the host of features on this device very easy to access. In build, this device is solid. And thanks to excellent ergonomics, this is also very easy to carry around with you anywhere you need to record. And lastly, for powering, you have the option of choosing between a rechargeable battery (Li-ion), AA batteries or an AC adapter. Features both cardioid and omnidirectional mics. XLR inputs and 48V phantom power, so you can also use pro-level external mics. Sophisticated filtering functions to help refine your audio to your tastes. Built-in speakers, so you can audition your recording. Can be mounted on a tripod. This might be a portable device but it is actually quite heavy. If you want to record sound FX in the field for projects like films, interviews or a song, then you’ll need something with a relatively high-quality audio resolution. On the other hand, if you need the recorder for simpler tasks like rehearsals or voice memos, then high-quality audio isn’t an absolute necessity. So, in cases like these, you can skimp on quality and save the extra bucks. As you can see, the “best” is more contextual than absolute. Generally, portable audio recorders are usually inexpensive. And even if you need something high quality as you discovered from answering the first question, it rarely crosses the $200 mark. There are portable audio recorders that accept external memories like an SDHC card or a microSD card. Others do not. You’ll need to be sure of how much space your device can handle before deciding on a card. You’ll also need to know how much the device itself can support. Similar to what you do when looking at the specs for a new smartphone. When searching, you’ll find that some recorders will come with really large internal memories while others will have smaller internal memories but will be compatible with any size microSD cards. Portable audio recorders come with different audio recording capabilities. For instance, some can only record a single track at a time. And then there are some that record multiple tracks at the same time, usually two, but sometimes a lot more. Now, if you won’t be needing more than one or two channels, then it’s pointless spending the extra on recorders with many channels. Whichever you choose – internal or external mic – there are advantages. Internal mics are very convenient, and you won’t have to bother with additional equipment and cables. But as your skills get more advanced, convenience might be less important to you. You might prefer having an external mic since you’ll be to place the mic exactly where you want it for the best sounding results. Although they may be smaller in size than regular recorders, portable audio recorders can pack some really nice, high-end features. Some of them come with filters, slow-mo playback, LCD screens, and effects. Are any of these of use to you, if so go for them. But, of course, the more features you want, the more you should be willing to spend. There are all kinds of accessories available for portable recorders. From carrying bags to windscreens to tripods, etc., the list is long. It all depends on the needs of the user. While some might only need a tripod, others might need more. Thankfully, some recorders actually come in a bundle and at a great price as well. It was kind of like a tug of war deciding between the Zoom H6 and the Tascam DR-100. In our opinion, these two are equally professional, high-end devices with loads of benefits. But after everything, we had to settle for the Tascam DR-100 over the Zoom H6 for the following reasons. One, the Tascam DR-100 is far more pocket-friendly than the Zoom H6, especially since both devices deliver nearly the same quality. Also, the battery power of the Tascam DR-100 is something else. This device can successfully go on recording for 9 hours straight! The Zoom H6, on the other hand, delivers only 2 hours. And the Tascam comes with both Cardioid and omnidirectional mics, unlike the Zoom H6 that’s only omnidirectional. The Tascam DR-100 is obviously the clear winner. But in a close second place, is the Zoom H6.